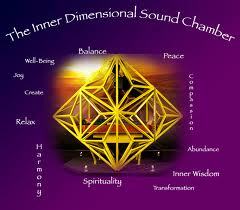 The Inner Dimensional Sound Chamber honors the body’s natural geometric ability to heal itself at the cellular level. It sends specialized music or sound through the structure creating interference patterns. Throughout the ages sound and music, originally a highly developed science in the ancient mystery schools, have been used as vehicles for healing. This healing was based on concepts of life that recognized vibration as the fundamental creative force. Sound and Light are the building blocks of the universe, the very framework upon which all of creation is hung. Every molecule of matter is intoning its tone. Every leaf, atom, particle, planet, galaxy, every cell in our body is humming its own tune. Even as we were being born, as our bodies were being formed a chord was being intoned, our own individual chord. Music affects the physical body in profound ways. Sound enters our physical body and moves atoms around, rearranging our cellular structure and returning us to order and balance. Music, in its higher forms, has the power to lower blood pressure, alter our breathing rate, reorganize and harmonize molecular structure, elevate mood, take us beyond the everyday world to the spiritual world, transform consciousness and ultimately liberate our Spirit. The word ‘sound’ can be used to refer to ‘wholeness’ or ‘vibration’. When music or specialized sound in the form of brain wave patterns are played through the hollow structure of the Inner Dimensional Sound Chamber, there is an additional benefit based on vibrational technology. Research on the physics of sound suggests that sound organizes form. Through interference patterns, it can cancel or enhance vibrational patterns naturally occurring in the body. Harmonic resonance is the way in which cells retain memory. Intent is the primary value to sound therapy. In essence, the frequency (number of cycles per second the sound is vibrating) plus intent equals healing or a positive therapeutic effect. Through vibrational technology, there is an extreme activation of tissue regeneration. The capacity for tissue regeneration extends to the central nervous system and the brain to healing organs, muscles, and bones. 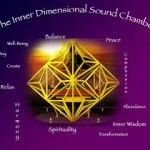 The Inner Dimensional Sound Chamber assists in releasing such energies as . . . Helps Promote . . .